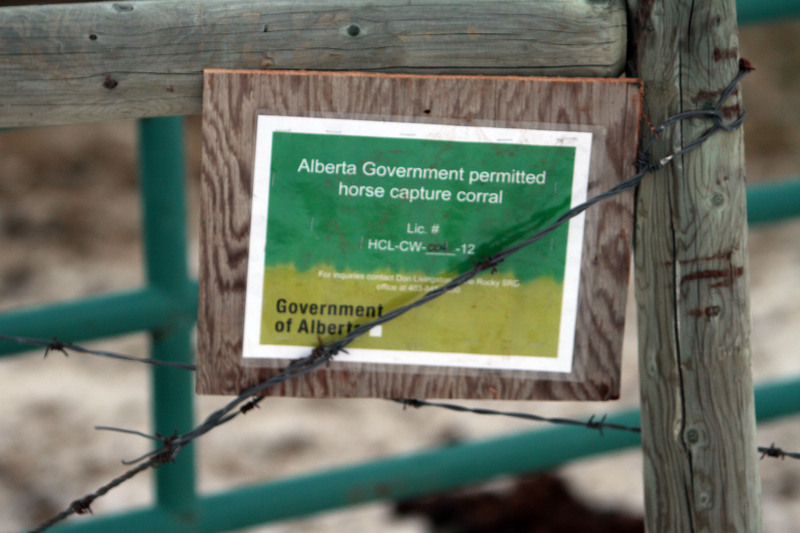 The Government of Alberta, Sustainable Resource Development, department has launched what we believe a full scale assault on the wild horses of Alberta. This year there are more individuals with permits and more capture pens set up than there have been for several years. SRD has issued this many permits and encouraged these individuals to take a large number of the wild horses out of their natural environment. 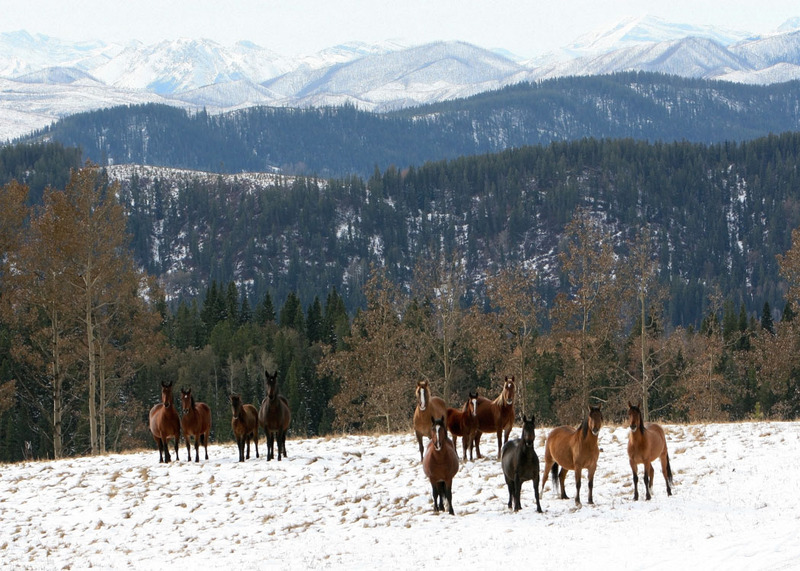 WHOAS believes that contrary to what the officials say that they are bowing to pressure from self vested groups who want all the horses removed from our Alberta foothills. 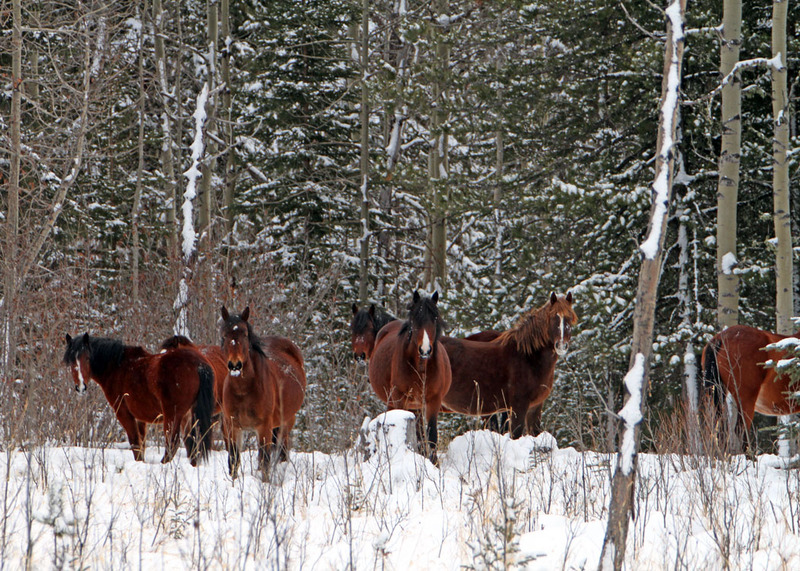 Last year the SRD started this campaign and authorized the removal of a large number of horses throughout the province. We know that the large majority of those captured ended up being sent to a horse slaughter plant. Again this year the number of horses that are being captured is high. 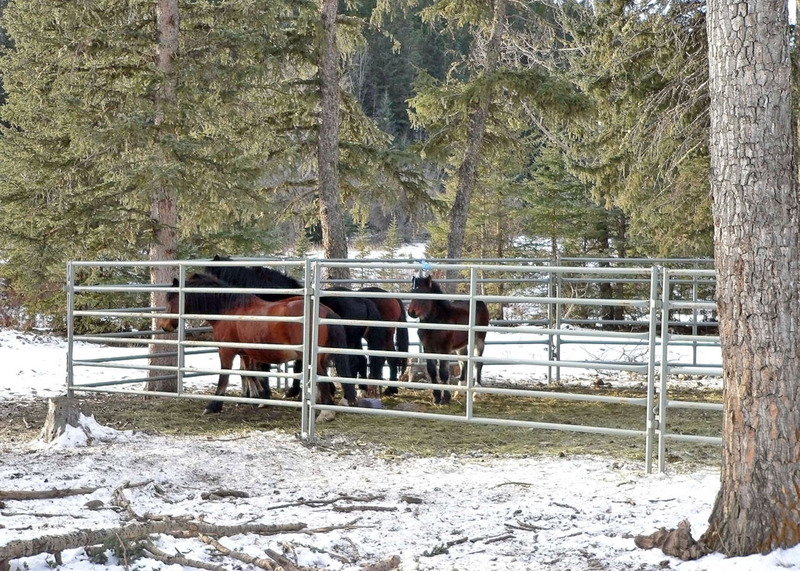 Silently the government of Alberta has changed the horse capture regulations to a point that they reflect the determination of the SRD to rid the province of what they believe are nuisance animals. Where it used to be 3 studs to one mare, this does not even exist anymore. Where they used to claim that they regulated how many animals “at the most 20-30 horses” this number seems to have been thrown out the window. Also we’ve noted that once the capture season was over, these individuals did not remove their capture pens as was the rule before. This allows our wild horses to become accustomed to these threats and therefore more susceptible to being caputured. This season continues until March 1st and many of the mares are now heavy with foal. Imagine the stress!!!! These alleged cowboys have no other interest other than the money they get from the slaughter houses. And with slaughter prices for horses being so low, it appears to WHOAS that some are just doing this for their own egos. 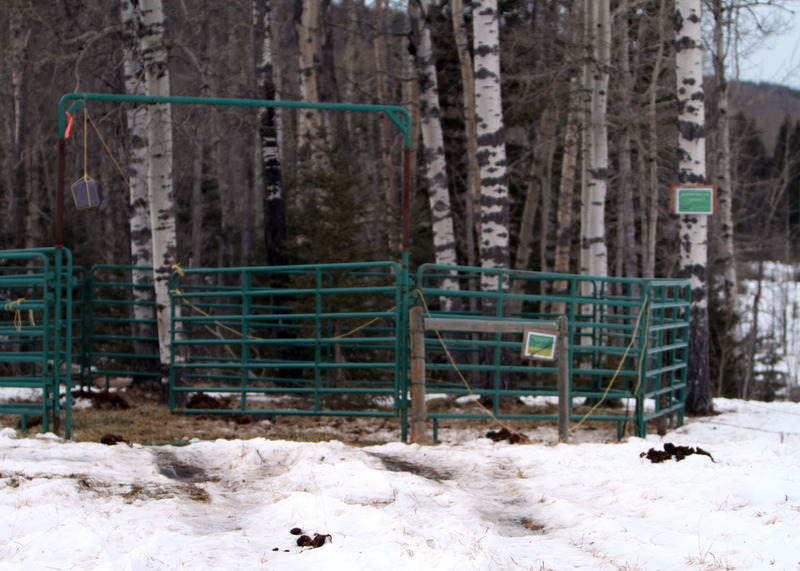 The winters of 2010 and 2011 were extremely hard on the wild horses. A large number of foals died and many of the mares aborted in order to survive. Therefore the number of horses due to nature was naturally down. According to our observations, and those of others that spend their time in the west country, the number of horses truly did not increase due to this and the heavy capture last year. In fact WHOAS believes that the numbers are down and will continue to go that way if the SRD continues their attack against your Alberta wild horses. It is well known that they are listening to logging companies that claim the wild horses are doing damage to the environment and their new seedlings. This is despite all the scientific evidence to the contrary. In large tracks of our public land the logging companies have decimated the natural environment of practically all wild animals and birds that used to call this home. Who’s hurting what out there? We believe they should leave the horses alone. Now these logging companies are going down into Kananaskis country to ruin it too (the Castle and West Bragg Creek) with the blessings of the SRD. The SRD chooses to manipulate issues to benefit their ideas with disregard to the well being of the natural ecosystem’s of Alberta. I point out that in the Sheep River, Bighorn Sheep Reserve it is amazing to see one sign that says that the government biologists say that the bighorn sheep are causing damage to their grazing area since the sheep feel safe in this area and do not move. Yet a short distance down the road on the same rangeland is a sign by the government stating that they use hundreds of head of cattle to reduce the biomass of the sheep range allegedly to enhance available forage for wildlife. Is this not a contradiction? With the upcoming election, now is the time to make our government, who is supposed to work for us, pay attention to what Albertans value as part of our natural heritage and stop destroying our land and the wonderful animals, including the wild horses, that live there. We urge you to get as many people as possible to write (e-mail) directly to the Premier and the Minister of Sustainable Resources. We need to stop this capture season now and not later!!!! Please help. Ask your friends to join the fight to save your wild horses. They belong to all of us.